It was supposed to be a turning point. Real Madrid made light of their rocky road in 2012-13 on Sunday to produce their best football of the season in a defiant display of unity, swagger and strength, as they thrashed Valencia 5-0 at the Mestalla. All appeared well despite the troubles of the previous months, but the club’s watershed moment turned out to be merely a mirage. On Wednesday, the club awoke to more negative press as Marca published details of the power struggle taking place behind the scenes at the Santiago Bernabeu. “Presi”, their front page announced on Wednesday, “either Mourinho goes in June, or we do”. The paper claimed club captains Iker Casillas and Sergio Ramos handed president Florentino Perez and general director Jose Angel Sanchez the ultimatum in a meeting on Tuesday. The four men met for lunch in Madrid’s ACS hotel to discuss bonuses for the rest of the season in the Champions League and Copa campaigns. Marca claim Perez praised the players for the team’s performance at Valencia on Sunday and that they, in turn, underlined their commitment to the cause for the rest of the current campaign. This new-found unity, however, did not extend to the coaching staff. Either Mourinho leaves in June, Ramos and Casillas were reported to have told their superiors, or many of the club’s finest footballers would be asking for a move in the summer. Mourinho was not present in the meeting and the Portuguese was also absent as Perez refuted the story at a packed press room at 13:00 on Wednesday. A furious Florentino claimed the report had been both “unethical” and “untrue”, though Marca maintained moments later that they were sticking to their story. Blancos responded with an official statement in which Iker and Sergio said they were behind their boss. 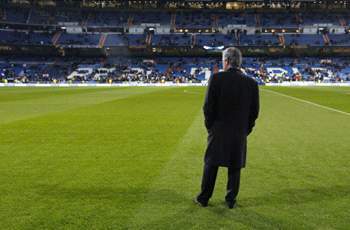 “We want to show our support to the figure of our coach, Jose Mourinho,” it read, “to whom we owe the maximum respect”. Tellingly, however, Perez claimed during the hasty press gathering that he had not spoken to Mourinho. The decision to face his detractors had been his and the whole episode raised more questions than answers. Why speak now? Why respond to this story when countless others have come and gone without comment? Why was Mourinho not involved or even consulted? And what exactly is going on? Real’s relationship with Marca has long been intimate. Madrid’s honorary president, Alfredo Di Stefano, writes weekly for the popular paper, while journalist Enrique Ortego pens the player profiles on the club website. The relationship is mutually beneficial and Perez returned to the presidency in 2009 on the back of unconditional support from the publication. Florentino filters stories to Marca when he considers it convenient, but the paper also has several sources within the dressing room itself (even Mourinho admitted last year that two or three of his squad talk to the press behind his back) and when players are unhappy, they usually find out. Last January, news of a training-ground dispute between Mourinho and Ramos reached the paper and adorned the front page after the coach criticised the defender for switching marking duties with Pepe during the 2-1 defeat to Barcelona in the Copa del Rey at the Santiago Bernabeu. Perez kept quiet then and there was sustained silence from the president as the paper launched a vicious campaign to oust Mourinho’s predecessor, Manuel Pellegrini, in 2010. 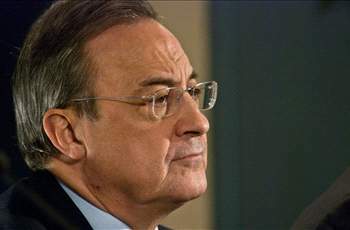 But Florentino fought back on Wednesday amid times of turmoil and chaos at the capital club. The construction magnate is desperate to unite the team and regain some power after conceding almost complete control to Mourinho. And with elections ahead in the summer, his is a voice the Madrid fans need to hear. Perez, however, refused to answer the questions, did not deny anything but the story in question and only offered lukewarm backing to Mourinho. The president dismissed the Marca report but he knows full well what is going on in the Madrid dressing room and while talk of an ultimatum is off the mark, the coach has fewer friends with each passing week at the Bernabeu. The Portuguese is running out of allies in Madrid after publicly criticising the club, its fans and many of the players this season. Dressing room divisions run deep, with two separate factions at the capital club, one in support of Mourinho, the other against him. Casillas and Ramos belong to the second set, while the first group is made up largely of the players represented by Portuguese agent Jorge Mendes – Pepe, Angel Di Maria, Fabio Coentrao and Ricardo Carvalho, plus Jose Callejon and Alvaro Arbeloa. Cristiano Ronaldo also belonged to this bloc, although his recent run-in with his compatriot has cooled their once healthy relationship. Perez now believes he made a mistake in renewing Mourinho‘s deal last summer, when the Portuguese penned a new long-term contract which ties him to the club until 2016. An agreement is now likely to be reached at the end of this season to rescind that arrangement. The side’s dismal performance in La Liga has damaged the coach’s credibility at board level, while the 49-year-old’s actions this term have further tested the president’s patience. Mourinho has upset the club on numerous occasions in 2012-13. The former Inter boss has dropped both Ramos and Casillas, failed to represent Real at the Ballon d’Or or make an appearance as the club’s new youth academy was unveiled, has publicly criticised Castilla coach Alberto Toril and fought with half of his playing squad, including Ozil, Di Maria, Ronaldo, Kaka and the two club captains. His relationship with the media in Madrid is also at a low and that is bad news for a Real coach. The knives are out among the Spanish press pack and Marca hit back on Thursday by publishing text messages from club representatives on their front page to back up the sources behind the previous day’s controversial story. Real Madrid are in turmoil, and unless things change drastically and for the better in the coming weeks, there will be no winners in this particular power struggle at Real Madrid.